Rob graduated from the University of New Mexico in 1971, making the Dean's list his last three semesters. He joined Dean Witter (now Morgan Stanley) in 1975 and received his securities education at the New York Institute of Finance. He spent 9 ½ years at Witter, becoming a Vice President, specializing in institutional investments and municipal finance. Rob formed First American Asset Management in 1985. 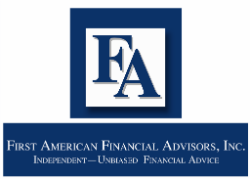 The firm later changed its name to First American Financial Advisors, to more closely reflect the services it provides its clients. He was with LPL Financial Services from 1989 to 2014. He has been the financial advisor on more than $3 billion in financial transactions for cities, counties and tribes around the US. Rob was elected to the New Mexico House of Representatives in 1998. While a member, he received many awards, including: National Association of the Mentally Ill 2000 National Legislator of the Year and New Mexico Association of Counties Leadership Awards. Rob currently serves as a financial and registered municipal advisor to many New Mexico municipalities and counties and to tribal governments around the United States. He a member of ESPN's New Mexico Bowl Executive Board of Directors, the New Mexico Amigo's and is active in charitable causes.